Standing in a field of roses in eastern Afghanistan, former poppy grower Mohammad Din Sapai quickly but carefully plucks the delicate petals that will be turned into rose water and oils for sale around the world. The sweet smelling crop is providing farmers in Nangarhar province with a viable alternative to growing opium poppies, the sale of which has fuelled the conflict raging across the country. "I am very happy with this harvest of flowers," Sapai tells AFP as he stands among hundreds of blooming rose bushes. Sapai is one of more than 800 farmers in the province bordering Pakistan benefiting from the "Roses for Nangarhar" project, a joint Afghan-German initiative set up in 2007 to encourage poppy growers to switch to a legal, money-making flower. "They provided us with the plants, the tools and even paid us for the first year when we had no harvest," Sapai, 50, explains. "Now I have 600 plants and I collect up to 1,200 kilos (2,650 pounds) of petals." Opium is big business in Afghanistan, where Nangarhar is the sixth biggest poppy-producing province. Poppy cultivation hit a new record last year, with opium production soaring 87 percent to an estimated 9,000 tonnes, official figures show. But Sapai says he is perfectly happy to grow roses. He makes enough money to support his family, and insists roses have fewer costs and take less effort. After the rose season, which ends in May, he switches to growing vegetables. Starting at dawn and working until late morning when the heat sets in, Sapai and his workers appear resigned to the constant dangers lurking around them as they quickly pick off petals and drop them into large bags. Nangarhar is rife with fighters belonging to the Islamic State group (IS), which emerged in Afghanistan by the end of 2014 and quickly turned the province into a stronghold. The Taliban also roam the area, and bombs planted along the roads leading to rose fields are a constant threat. In nearby Omar Qala village, teacher and rose-grower Shah Zaman is also convinced about the benefits of harvesting petals instead of poppies. "The people here used to cultivate poppies but this is haram (forbidden under Islamic law)," Zaman tells AFP. He expects to harvest one tonne of petals this year. "The roses are much better... I make good money from roses. They are resistant and don't require as much expense or work." Khan Agha, a representative for Afghan Rose Ltd in Dara-e-Noor district, which emerged out of the Afghan-German initiative, agrees. Roses "do not require watering, fertiliser or care" -- unlike poppies, he says. Rose trees are also more durable, lasting 30 to 50 years, compared with poppies, which must be planted every season. "We have solid contracts with the farmers who grow roses asking them to stop cultivating poppy and other types of narcotics, and the places where we grow roses are clean from poppy 100 percent," he adds. 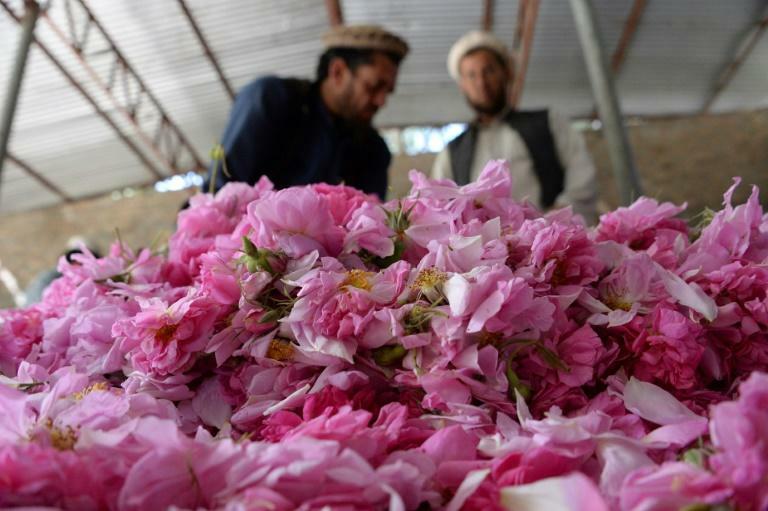 The farmers grow a variety known as Damask roses, which were brought from Bulgaria by the Germans but are endemic to Afghanistan, says Mohammad Akbar Mohmand, the owner of Afghan Rose Ltd. The petals are distilled in the provincial capital Jalalabad. It takes about six tonnes of petals on average to extract one litre of essential oil. At peak harvest time, Mohmand's distillery employs more than 120 people. From dawn until late morning, trucks flow from districts across the province delivering their precious cargo. Once picked, rose petals begin to wilt within hours and lose their scent. "The roses picked in the morning have to be distilled the very same day, even if we have to work until 2:00 am or 3:00 am," explains Mohmand, as bags of petals are poured into seven huge stainless steel vats. Shortly before the "Roses for Nangarhar" project started, Afghan entrepreneur Abdullah Orzala began growing roses and distributing the plants. The US-trained engineer recently opened a boutique in Kabul selling rose water and perfumes to middle-class Afghans and foreigners. He has 100 hectares (250 acres) of roses, but hopes to triple the number of plants next year "if the security (situation) allows". Like Mohmand, Orzala never stops worrying about the constant threat of violence. In 2016, 50 farmers working for him packed up and abandoned their crops in Achin district after it became an IS stronghold. "You can deal with the Taliban, but you can't mess with Daesh," he says, using the Arabic name for IS. Two years later, his farmers remain displaced further north. Afghan Rose Ltd also closed the Achin distillery and retreated to Jalalabad. Its rose oil now supplies several European companies, including German organic cosmetics brand Dr. Hauschka -- whose products are priced well out of reach of ordinary Afghans. "They make very expensive creams with our roses," says Mohmand. Orzala exports its rose oil to Canadian company The 7 Virtues, which also sources essential oils from Haiti, the Middle East and Rwanda under the slogan "Make perfume, not war". It is a message that has more than a whiff of support among Nangarhar farmers.